Dungeness Stingers, also known as deep stingers. Click pictures for larger images. All orders ship by US Mail. Products normally ship next day. We accept Visa, Mastercard, and Discover as well as PayPal. When checking out online you may have to go through several screens before you get to the option to use your card. SECURE CHECK-OUT! Dungeness stingers with standard white or nickel finish. Great jigs at bargin prices. 10 oz white dungeness stinger jig. Fish will see this white jig even in deep or murky water. Great fishing lure for heavy currents, deep water and big fish. Catch halibut, ling cod, salmon, rock fish, big lake trout, yellow tail, albacore, sheepshead, and any other deep dwelling fish. 10oz stingers are 6 7/8 inches long. 10 oz white stinger. Same as above, but with j-hook. 6 1/2 inch long 8 oz white Dungeness Stinger with treble hook. Great for deep water, strong currents and large fish. Catch halibut, ling cod, salmon, rock fish, big lake trout, yellow tail, yellow fin and albacore tuna, and whatever else you fish for. 8 oz white stinger jig. Same as above, but with j-hook. 6 oz White Dungeness Stinger with treble hook. Fish love this color! They can see it even in deep or murky water. Cast off your boat or vertically troll to depths of up to 250 feet, depending on wind and current. Catch halibut, ling cod, chinook salmon, tuna, rockfish, big lake trout, and any other good sized fish. 5 11/16 inches long. 6 oz white Dungeness Stinger. Same as above, but with j-hook. 5 1/4 inch long 4 1/2 oz white Dungeness Stinger with treble hook. Cast from sailboat, motorboat, or dock. Vertically troll from surface to bottom to a depth of up to 200 feet with this medium sized jig, depending on wind and current. Catch chinook salmon, coho salmon, halibut, ling cod, tuna, dorado, rooster fish, and any other fish that eats fish. 4 1/2 oz white Dungeness Stinger. Same as above, but with j-hook. 4 5/8 inch long 3 oz white Dungeness Stinger with treble hook. Great for coho salmon, kokanee, dolly varden, cutthrroat trout, largemouth bass, steelhead, pink salmon, dorado, shallow water ling cod, flounder, sole, rooster fish, california halibut, and any other fish that eats small baitfish. 3 oz white Dungeness Stinger fishing jig. Same as above, but with j-hook. 2 oz white Dungeness Stinger with treble hook. Great in light currents, shallow water, beach fishing, and for catching smaller fish. Use for coho and pink salmon, steelhead, trout, albacore, flounder, sole, smallmouth bass, cod, California halibut, and any other fish that eats small baitfish. 4 inches long. 2 oz white Dungeness Stinger fishing jig. Same as above, but with j-hook. 3 1/4 inch long 1 oz white Dungeness Stinger jig with treble hook. Great for light currents, shallow water, beach fishing, and small fish. Cast from any boat, including kayaks and canoes. Catch salmon, trout, albacore, flounder, sole, smallmouth bass, cod, California halibut, and any other fish that eats small baitfish. 1 oz white Dungeness Stinger jig. Same as above, but with j-hook. Half ounce white Dungeness Stinger with treble hook. Excellent coho salmon jig. Also great for any shore fishing, for lakes and rivers, and for trout, Dolly Varden, smallmouth bass, and many other species of fish. 2 5/8 inches long. Unpackaged half ounce white dungeness stinger fishing lure. Same jig as above, but with siwash hook. 6 1/2 inch long 8 oz nickel Dungeness Stinger with treble hook. Excellent for deep water, heavy currents, and any species of trophy sized fish. 8 oz Dungeness Stinger fishing jig. Same as above, but with siwash hook. Unpackaged 6 oz nickel Dungeness Stinger fishing jig. Same as above, but with siwash hook. 5 1/4 inch long 4 1/2 oz nickel Dungeness Stinger with treble hook. Great for salmon, halibut, rooster fish, dorado, ling cod, tuna, largemouth bass, and many other species of fish. 4 1/2 oz nickel Dungeness Stinger fishing jig. Same as above, but with siwash hook. 3 oz nickel Dungeness Stinger with treble hook. Catch salmon, trout, steelhead, bass, kokanee, flounder, sole, California halibut, lingcod, tuna, dorado, rooster fish, and many other species of fish. 4 5/8 inches long. 3 oz nickel Dungeness stinger fishing lure. Same as above, but with siwash hook. 4 inch long 2 oz nickel Dungeness Stinger with treble hook. Catch anything that eats small baitfish. 2 oz nickel Dungeness Stinger fishing jig. Same as above, but with siwash hook. 1 oz nickel Dungeness Stinger with treble hook. Catch salmon, trout, steelhead, flounder, sole, and any other fish that eats small baitfish. 3 1/4 inches long. 1 oz Nickel Dungeness Stinger fishing jig. Same as lure above, but with siwash hook. 2 5/8 inch long half ounce nickel Dungeness Stinger with treble hook. Wonderful coho salmon jig, also excellent for trout, kokanee, smallmouth bass, Dolly Varden, and any other fish that eat small baitfish. Half ounce nickel Dungeness Stinger fishing lure. Same as above, but with siwash hook. Dungeness stingers in fancy colors, and with a tougher finish. Cost a little more, but worth it. 6 oz Nickel Green Dungeness stinger with treble hook. The Nickel Green color most closely resembles the coloring of actual baitfish. Great for halibut, lingcod, salmon, tuna, rockfish, large lake trout, and anything else you fish for. 5 11/16 inches long. 6 oz nickel green Dungeness Stinger. Same as above, but with j-hook. 4 1/2 oz Nickel Green Dungeness stinger with treble hook. Great for casting off any boat or vertically troll up to 200 feet depending on wind and current. Catch chinook or coho salmon, halibut, dorado, rooster fish, and any other fish that eats fish. 5 1/4 inches long. 4 1/2 oz Nickel Green Dungeness Stinger fishing jig. Same as above, but with j-hook. 3 oz Nickel Green Dungeness Stinger with treble hook. Perfect for coho and pink salmon. Also catches kokanee, largemouth bass, dolly varden, trout, steelhead, shallow water ling cod, flounder, rooster fish, dorado, and any other fish that eats small fish. 4 5/8 inches long. 3 oz Nickel Green Dungeness Stinger fishing jig. Same as above, but with j-hook. 2 oz Nickel Green Dungeness Stinger with treble hook. Fish will think this jig is a real candlefish. Great for beach fishing, light currents, shallow water, lakes and rivers. 2 oz Nickel Green Dungeness Stinger fishing jig. Same as above, but with j-hook. 1 oz Nickel Green Dungeness Stinger fishing jig. Same as above, but with j-hook. 6 oz Nickel Blue Dungeness Stinger fishing jig. Same as above, but with j-hook. 4 1/2 oz Nickel Blue Dungeness Stinger fishing jig. Same as above, but with j-hook. 3 oz Nickel Blue Dungeness Stinger fishing jig. Same as above, but with j-hook. 1 oz Nickel Blue Dungeness Stinger with treble hook. Works great in shallow water and light currents. Use for lakes, streams, shallow salt water and beach fishing. Catch salmon, trout, steelhead, kokanee, albacore, sole, flounder, smallmouth bass, California halibut, cod and many more bait loving fish. 3 1/4 inches long. 1 oz Nickel Blue Dungeness Stinger fishing jig. Same as above, but with j-hook. 6 oz Pearl Green Dungeness Stinger with treble hook. Cast off any boat, or vertically troll to depths of up to 250 feet, depending on wind and current. Great for chinook salmon, halibut, rockfish, large lake trout, lingcod, tuna, and any other large deep dwelling fish. 5 11/16 inches long. 6 oz Pearl Green Dungeness Stinger fishing jig. Same as above, but with j-hook. 5 1/4 inch long 4 1/2 oz Pearl Green Dungeness Stinger jig fishing lure with treble hook. Great color with both dark and light elements for any water clarity. Catch chinook or coho salmon, halibut, dorado, roosterfish, large lake trout, tuna, or any fish that eats baitfish. 4 1/2 oz Pearl Green Dungeness Stinger fishing jig. Same as above, but with j-hook. 3 oz Pearl Green Dungeness Stinger fishing jig. Same as above, but with j-hook. 2 oz Pearl Green Dungeness Stinger with treble hook. This jig has both dark and light aspects for any color of water. Cast from boat, dock, beach, lakeshore or riverbank. Vertically troll up to 100 feet depending on wind and current. Catch anything that eats small baitfish. 2 oz Pearl Green Dungeness Stinger fishing jig. Same as above, but with j-hook. 1 oz Pearl Green Dungeness Stinger with treble hook. Great fish-attracting action catches a wide variety of fish species. Use any time you need a small jig. Works wonders for catching false albacore, bonito, and coho salmon. 3 1/4 inches long. 1 oz Pearl Green Dungeness Stinger fishing jig. Same as above, but with j-hook. 6 11/16 inch long Pearl Blue Dungeness Stinger with treble hook. The fast sinking action gets this jig right to where the fish are. Catch chinook salmon, lingcod, rockfish, tuna, halibut, large lake trout, and other big bait-eating fish. 6 oz Pearl Blue Dungeness Stinger fishing jig. Same as above, but with j-hook. 4 1/2 oz Pearl Blue Dungeness Stinger fishing jig. Same as above, but with j-hook. 3 oz Pearl Blue Dungeness Stinger with treble hook. This color has both light and dark features so fish will see it in any water. Deep or shallow, clear or murky. Cast from beach, dock, boat, lakeshore, or riverbank. Vertically troll to depths of up to 150 feet depending on wind and current. Catch any fish that eats small baitfish. 3 oz Pearl Blue Dungeness Stinger fishing jig. Same as above, but with j-hook. 2 oz Pearl Blue Dungeness Stinger jig fishing lure. Same as above, but with j-hook. 1 oz Pearl Blue Dungeness Stinger with treble hook. Fish love this lure! It has both dark and light features to catch their eye in any water from clear to murky. Use this small jig for beach fishing, lakes, streams, and shallow salt water with light currents. Catches any fish that eats small baitfish. 3 1/4 inches long. 1 oz Pearl Blue Dungeness Stinger fishing jig. Same as above, but with j-hook. 300 feet of 8 strand 1.3 mm thick 220 lb test line. 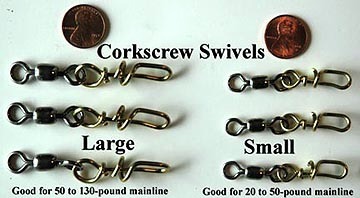 Use of swivels helps prevent jig loss. Use small swivels with 6, 8, and 10 oz Stingers. 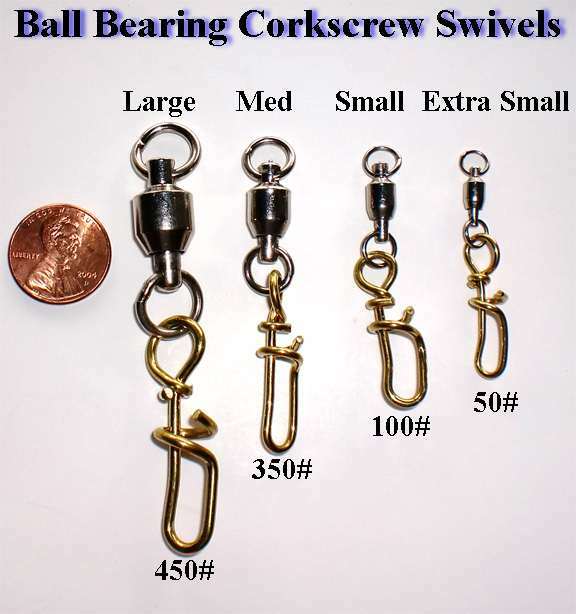 3-pack small ball bearing corkscrew swivels. Change jigs with ease. Recommended for 6-10oz stingers. 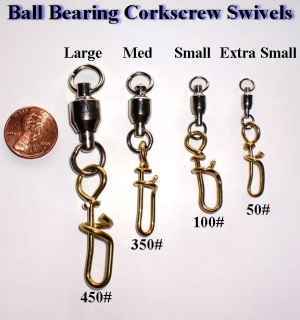 3-pack ball bearing corkscrew swivels, extra small. No more knot tying for jig changes. Recommended for 4 1/2 oz and smaller stingers. Rotators are available on the rotators page. If your merchandise total is under $12.00 add postage here. 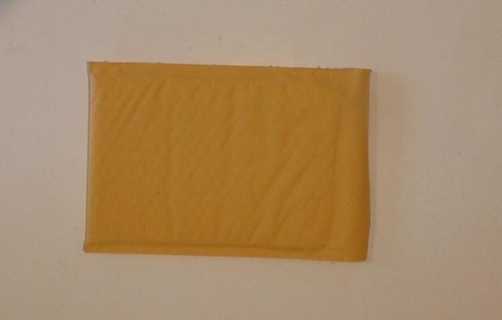 We can't ship orders for less than $12.00 without postage. We accept Visa, Mastercard, and Discover as well as PayPal. When checking out online you may have to go through several screens before you get to the option to use your card. SECURE CHECK-OUT! Products normally ship next day by US mail. This site is for USA customers only. If you are not in the USA CLICK HERE to shop for stingers.